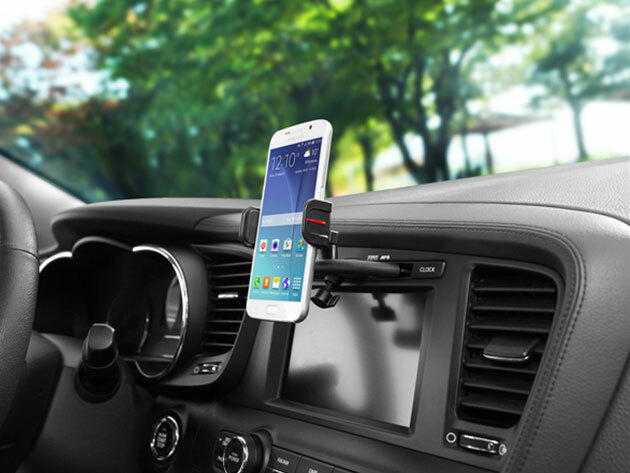 If you drive daily, especially to new destinations, it's wise to have a smartphone car mount. Aside from making map directions considerably easier to follow, they also keeps your phone in a central location so you can keep an eye on notifications without taking your eyes off the road. While most mounts attach to your dashboard via suction cup, the ExoMount CD inserts into your CD player which you probably aren't using all that much these days. Plugging into the CD drive assures a sturdy mount while the grip is compatible with any kind of smartphone. It can even be rotated 360 degrees, letting you orient your screen however you like. Until automakers start integrating smartphone mounts directly into the dashboard, this ExoMount CD is one of your best bets. You can get one here in the Boing Boing Store.